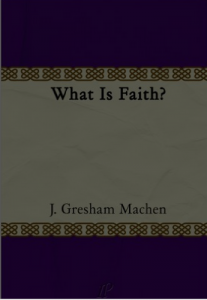 Machen wrote this defense of the fundamental faith of Christians in 1925, two years after his more famous Christianity and Liberalism. If the old adage is true, “Read one older book for every two new books,” I would add “unless you read Machen.” Then, you ought to read one of his for each modern book you read! Seldom do we find such clear thinking that goes right to the heart of a matter as we do with this older-thinking Presbyterian. And when it comes to the subject of faith, it sounds as if it could have been written of today’s seeker, contemporary, postmodern, convergent church! For example: “Christian faith, they say, is not assent to a creed, but it is confidence in a person. The Epistle to the Hebrews on the other hand declares that it is impossible to have confidence in a person without assenting to a creed.” Or this: “Faith is, indeed, nowadays being exalted to the skies; but the sad fact is that this very exaltation of faith is leading logically and inevitably to a bottomless skepticism which is the precursor of despair.” Why? Because “it is not as a quality of the soul that faith saves a man, but only as the establishment of contact with a real object of the faith.” The importance of proper thinking about faith and creed, love or work, is highlighted by the first book reviewed in this column. Today we have merely faith in faith where creed, or theology, must take a second place to the all-encompassing power of personal faith to gain what one wants. Such faith, says Machen, is human effort and never saved a soul.